Then I saw this post and had an "a-ha moment". The next day we were outside and I grabbed the chalk and drew leaves of different colors. Then I would say a color and Logan would spray water on the colored leaf. He loves the spray bottle. He usually uses it to clean supersoak the house. 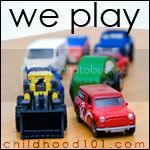 It's amazing how a new activity can become engaging when we begin with a prior activity that interests the child. Now, if only I can remember to do that every time we play!! 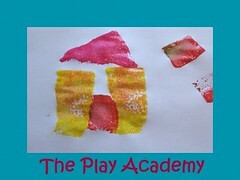 Visit for more play based fun and learning! ooo very fun activity! My son loves any activity with water! So this would be a huge hit! Oh I like your version! I like Hubbards Cupboard, too - we're doing the 3's curriculum - but my son doesn't show much interest in some of the activities there either, so we're trying to come up with our a-hah moments too! I might try this with my (almost) 2 yr old! My son loves spray bottles too, he's such a water baby! I love your honesty here! I swear, half of the "super fun" activities I find....my little guy couldn't care less. This is a perfect example of a little creativity going a long way. I love that your "a-ha!" moment meant that you got to combine what you wanted to do with something that he loved, and making it worthwhile for both of you :) Sometimes I could really do with one of those! Great thinking! It's all about engaging them in the fun, and starting from what they already love is a fantastic way to go.